Today, we are going to start the day on a high note; a shout-out to Niki Moore and Jez Murray, Ray's number one fans from over the pond. 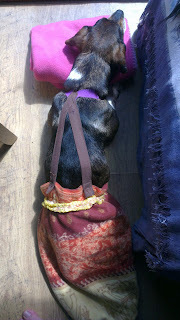 Last week, Niki and Jez took in as a 'foster,' a back-end paralyzed dog from Romania. Niki had been following on Facebook the plight of Rocky, a Dachshund mix that was found in a ditch by a kind soul who was trying to find him a home. 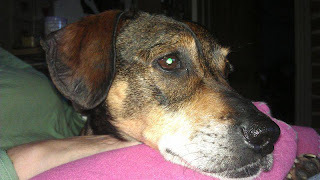 Rocky was brought to England because someone had agreed to adopt him. 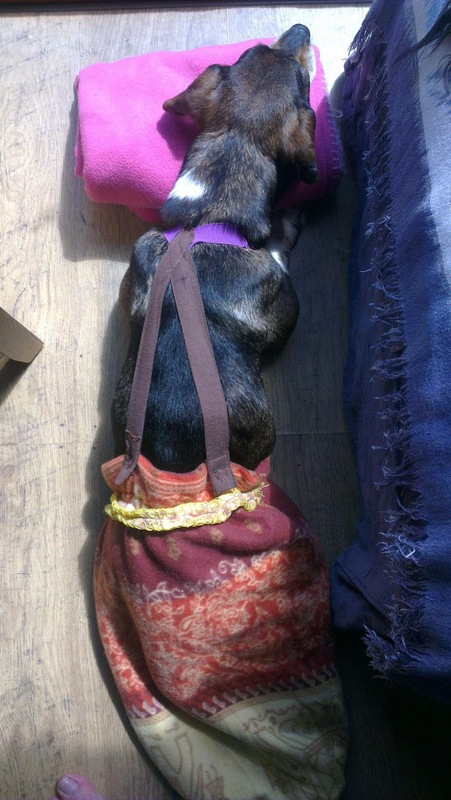 The someone backed out at the last minute, and Niki and Jez stepped forward to take on the challenge of a dog who chases their cats while dragging himself around the house wearing a 'dragbag.' Rocky came with his own Facebook page to which Niki and Jez have been posting photos and updates. Rocky joins the Niki and Jez menagerie of two dogs (one blind), three cats, and a bunch of hens. As always, Ray and I are impressed with the big-heartedness of his fans. Good for you Niki and Jez. 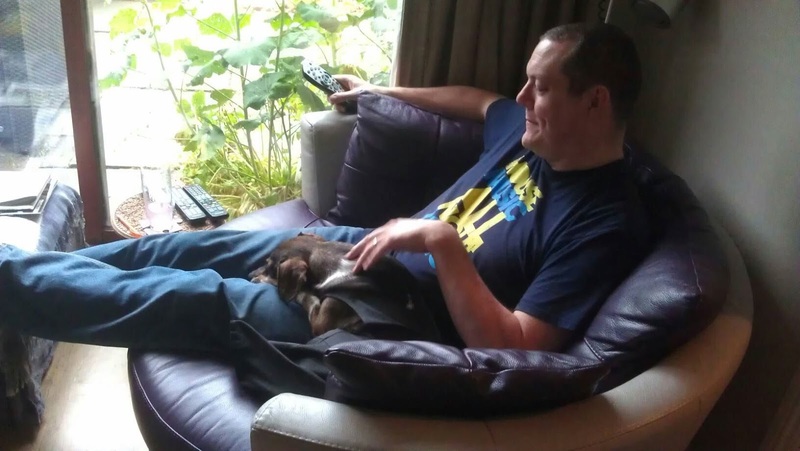 We hope that, if you don't keep the little nipper, you find him the best home ever. For those of you on Facebook, check out Rocky's Road to Happiness. Am I dreaming? Is this real? Have I died and gone to heaven? Rocky and 'foster' dad, Jez. How lovely, just one small amendment....4 cats are here to taunt and torture Rocky ! He is continuing to do well and we embark (no pun intended) on his rehab programme next week to see if any improvement can be made to his hind legs. We thank you for your interest ! Dang, I always get that wrong. I keep forgetting the former MIL cat. Niki and Jez rock! I love how he's bonded with Jez...their mutual admiration is clear to see. Rocky is a very lucky dog :) I've liked him on FB and I look forward to hearing about his life with the Moore-Murray family. What a great family to take him in! Hooray for another "special" being saved! !